This study seeks to introduce a framework that can assist anchor institutions in understanding their impact on the community and, in particular, their impact on the welfare of low-income children and families in those communities. Download the report and learn more about our work to help anchors measure their impact on community wealth. Learning cohort will build off the recommendations in The Democracy Collaborative’s report "The Anchor Dashboard"
Crossposted from Talkpoverty.org blog - a project of the Half in Ten Education Fund, a project of the Center for American Progress. Communities across the country are recognizing the tremendous resources nonprofit anchor institutions—such as hospitals and universities—can provide as engines of inclusive and equitable economic development. Increasingly, cities—often led by Mayors—are launching comprehensive strategies to leverage these institutions to address challenging problems of unemployment, poverty, and disinvestment. In 2014, several cities, including Chicago, Baltimore and New Orleans, have launched community building and job creation strategies that revolve around anchor institutions; and in Cleveland, a decade old collaboration of philanthropy, anchor institutions, and the municipal government continues to rebuild economies in some of the poorest neighborhoods in the city. In November, the Democracy Collaborative's Ted Howard and Sarah McKinley, along with Charles Rutheiser of the Annie E. Casey Foundation, presented The Anchor Dashboard as part of a national webcast at the Department of Housing and Urban Development. 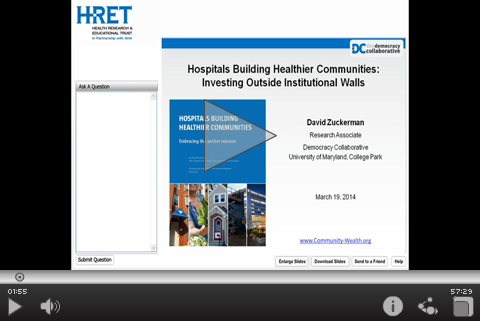 This webinar, organized by the Association for Community Health Improvement and the American Hospital Association, outlined opportunities for hospitals to promote health through economic development and community investment. The discussion used the findings of The Anchor Dashboard as a starting point to show how hospitals can broaden their impact on their surrounding communities. A few weeks ago, Oberlin College, with an endowment of nearly $700 million, adopted what is likely the largest impact-investing platform to date by a college or university in the United States. Although Oberlin is just one institution, the decision provides a hopeful sign of an accelerating institutional shift toward greater socially responsible investment practices. A tremendous opportunity exists. Higher education as a sector controls more than $400 billion in endowment assets. America’s colleges and universities are at a crossroads. For all too many students, a college education has become a major economic gamble. Over the past three decades, inflation-adjusted tuition has more than doubled at both public and private universities. Meanwhile, professors are harder to find: tenured and tenure-track professors have gone from roughly 45 percent of all teaching staff to less than a quarter since 1975. In short, students and their parents pay much more for much less faculty time.